Bobi Wine's house in Magere and inset is his Semakokiro Plaza followed by Chameleone's Sseguku based house while posing right by Daniella Villas and last but not least is Bebe Cool's Kiwatule based mansion that has seen much progress in the last months to the level of roofing. The music industry in Uganda is so competitive especially when it comes to these three top male artistes but their cribs have always been an interesting topic of discussion for the fans. Regarding Bobi Wine's Magere based crib, there is nothing much to write home about. Just recently, he moved his Fire Base office and studio to Semakokiro Plaza that has over 10 units boosting his savings as he won't have any office rent to pay. Chameleone is busy renovating his house though complaining of how cement prices are sky rocketing but fans have advised him to resort to using cow dung or he should very quickly come up with a concert of sorts tagged to house renovation. 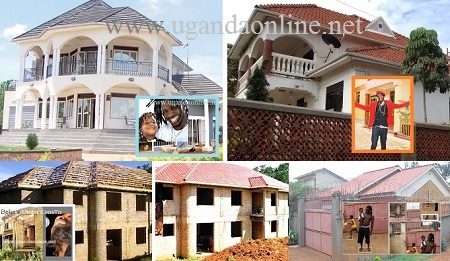 Bebe Cool has just roofed his luxurious 6in1 mansion and this very year, he could move in at least going by the progress on the house. The Kamwako singer has committed all resources to the house putting on hold his other activities like donating to charity, painting his current Ntinda house among others.